The current challenge at Sweet 'n Sassy Stamps is to use dots. As it so happens, one of the lessons by Julie Ebersole, in Online Card Classes' "Watercolor for Card Makers," involved making "watercolor" dots with watered-down Distress inks and an unused pencil eraser. So I decided to do that for this card. For the focal point, I used one of the images and a greeting from the "Love from Cocoa" stamp set by Sweet 'n Sassy Stamps. 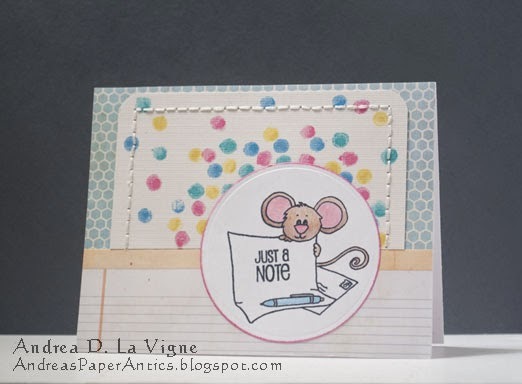 I stamped the image on a piece of white cardstock, using black dye ink by Stampabilities, and colored the mouse and pen with colored pencils. I die cut & embossed this with one of Spellbinders Classic Circle dies. To help the panel stand out against the background, I inked around the edges with Picked Raspberry Distress ink. I used two patterns from BasicGrey's "Fact" 6x6" paper pad for the background. The notebook pattern had a strip along the top, so I just used that instead of adding another strip as in the sketch. For the dots, I used Distress inks in Picked Raspberry, Mustard Seed, Salty Ocean, and Peacock Feathers. I applied the colors to an acrylic block I used as my palette, and misted them with water. Then I just took my pencil eraser, dabbed it in a color, and transferred the diluted ink to the cardstock. I had marked on the cardstock panel where the focal piece would go, and made sure to concentrate more of my dots around that area. After painting my dots and adhering the focal point panel to the card front, I felt it still needed something. So I got some embroidery floss that was about the same color as the dotted cardstock, and stitched around the perimeter of that panel. And that finishes this card. Sweet 'n Sassy Stamp's Challenge #11: "Polka Dots"
Virginia's View Challenge "Get Stitching"
Congrats on your win at SNSS with this cute card! It's so fun! Hi Andrea, your card is ever delightful! I love the pattern paper mix and how you made the design look cohesive with all the fabulous stitching! So glad that you play Virginia's View Challenge!